Planning your honeymoon or a romantic getaway? From high mountains covered in virgin rain forest to golden sandy beaches Koh Chang is one of Thailand's most beautiful destinations and the ideal place to enjoy your honeymoon or a romantic getaway. In addition to such a romantic location you will find the Thai people to be both gracious and charming. Providing you with a relaxing atmosphere and an exotic honeymoon experience you will cherish forever. 7 days, 6 nights accommodation, return private transfer, 2 resort meals and an opportunity to explore every thing Koh Chang has to offer. This Luxury Island Cruise will take you past more than 15 islands in the Koh Chang National Marine Park. The Cruise stops at 4 islands where you can enjoy some great swimming & snorkeling or just relaxing in the tropical atmosphere. This is spectacular day out includes an all day gourmet menu of breakfast, lunch, early and late afternoon snacks. For your enjoyment we have a fully equipped cocktail bar serving all your favourite cocktails and many other popular alcoholic drinks. Espresso is also available for extra charge. Walking on Koh Chang in the jungle near to Bang Bao fishing village. This hidden natural paradise is the spectacular tropical rain forest of Koh Chang. During your Jungle Trek you will have many opportunities to view Koh Chang's plant & wildlife. The rain forest on Koh Chang is home to a variety of animals; monkeys, birds, tarantula spider's, lizards and snakes. You will have the opportunity to stop at one of the inland waterfalls for a swim and lunch. Ban Kwan Chang Elephant Camp is located in Koh Chang's northern forests. Visiting the Elephant Camp you will have the chance to experience the life of the elephant in a natural environment. Elephant Trekking Includes a 1 hour elephant trek into the forest, 30 minute elephant bathing in one of the near by rivers and another 30 minutes feeding the elephants & enjoying a short elephant performance. 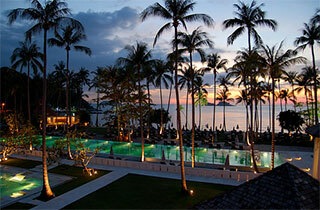 A sensational way of enjoy Koh Chang's lush jungle and forests. Located in the south Tree Tops Adventure Park contains an assortment of rope bridges, tarzan swings, flying skateboards, and giant zip lines. Altogether, there are over 30 obstacles in a beautiful hill-side area by the sea. No matter how old you are, our course is designed so that everyone can participate. In over 2 hours of fun and excitement.